Although Sea Anemones look like flowers, they are predatory animals. These invertebrates have no skeleton at all. They live attached to firm objects in the seas, usually the sea floor, rock, or coral, but they can slide around very slowly. Sea anemones are very long lived.Hermit crabs sometimes attach sea anemones to their shells for camouflage. Sea Anemones come in many shapes, sizes, and colors. Radially symmetric, they have a columnar body with a single body opening, the mouth, which is surrounded by tentacles. The tentacles protect the anemone and catch its food; they are studded with microscopic stinging capsules. Sea Anemones are usually about 1 to 4 inches (2.5-10 cm) across, but a few grow to be 6 feet (1.8 m) across. 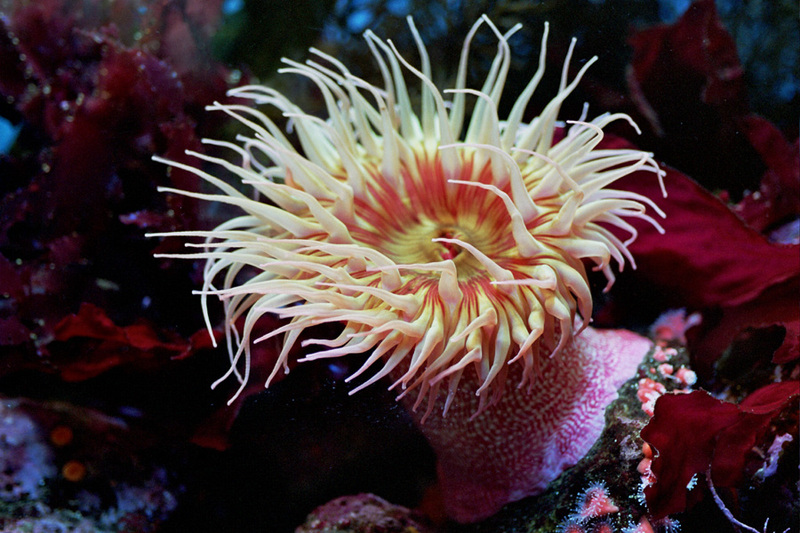 Sea Anemones are eaten by very few animals. Their predators include the Grey Sea Slug and the Tompot Blenny.